A recent business trip found me in Traverse City, Michigan with several inches of snow on the ground and a few minutes to kill before my flight back to the Lone Star State. A co-worker suggested I drive a few miles down the road to check out a bit of fly tying history. 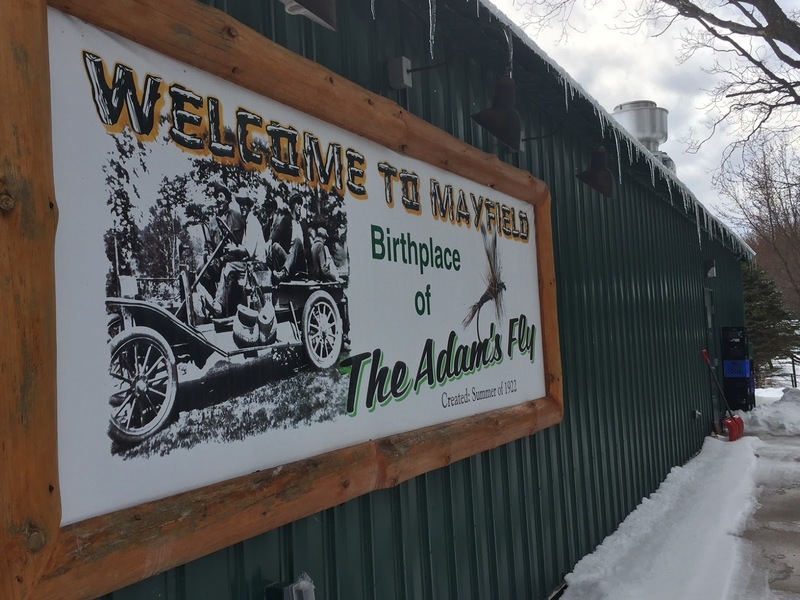 Mayfield, Michigan has a post office, convenience store, and is the birthplace of the Adam's fly. The very same Adam's fly that has been in my fly box (and I am guessing yours as well) since the first time I attempted fly fishing. The story goes that in the summer of 1922 local fly tyer, Leonard Halladay tied the Adam's for his friend attorney Charles F. Adams (more on him via Midcurrent) and the rest is history. The weather and my schedule kept me off the water this trip but I definitely am thinking of visiting for the urban steelhead run on the Boardman River.